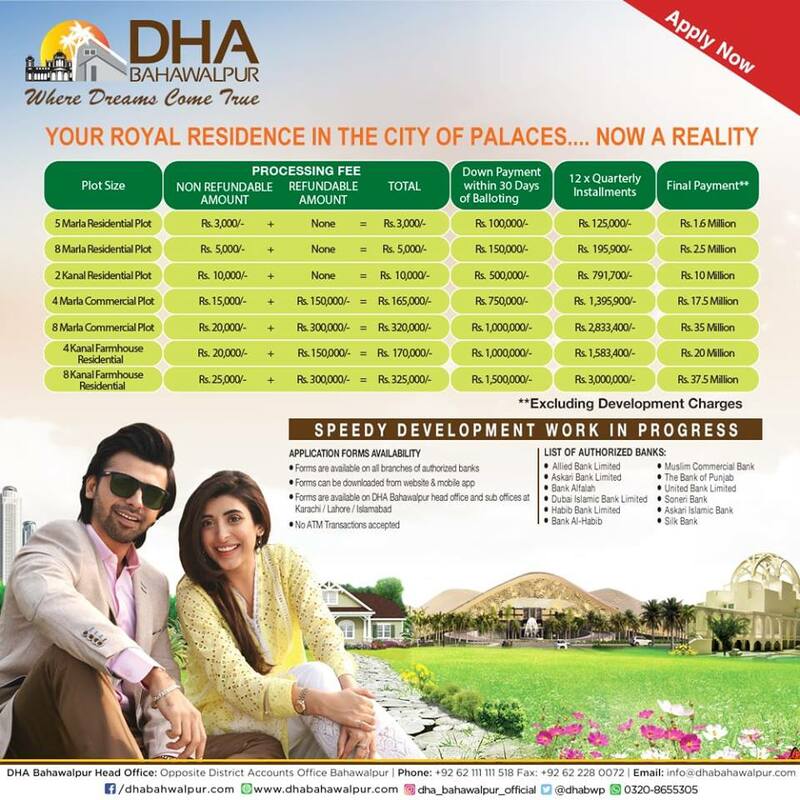 DHA Bahawalpur had launched luxury villas and residential plots earlier, which have been balloted on 31st January 2019. The society has now come up with 5, 8 marla and 2 kanal residential plots, 4 and 8 marla commercial plots, as well as 4 kanal and 8 kanal residential farm houses. Once you download the form and take a print out, simply fill in necessary particular. Attach passport size photograph and cnic copy, and submit along with processing fee and token money (if applicable) at the nearest branch of the designated banks. Step 1. Register yourself by providing basic information. Step 2. Login as per information (Email and Password) provided in step 1. Step 3. Visit “Submit Online Application” link and select the advertised plot size and bank name in which you intend to apply. Step 4. On submission of each online application, separate Bank Challan form will be generated. Step 5. Visit nearest branch of selected bank with printed application and challan form. Step 6. Deposit amount and bank staff will retain application form along with two copies of challan and return customer copy to the applicant. Keep challan “Customer Copy” for record with you. Concern bank will send application form and deposited challan copy to DHA. Step 8. Please provide correct information, making false statements may result in cancellation of application/plot. For Overseas Pakistanis, applications can be submitted online and processing fee can be submitted online in the given bank accounts. Overseas Pakistanis will deposit application amount via swift code at nearest bank. Complete above given Step 1 and Step 2. Provide transaction ID, swift code, scanned image/picture of deposit slip and category proof at step 3. Concerned staff at DHA will print the overseas Pakistanis application form, confirm payment through bank and update status online. Overseas Pakistanis are not required to deposit hard copies. Please provide correct information, making false statements may result in cancellation of application/plot. DHA Bahawalpur has not announced any deadline for submitting applications so far, but it is better to submit your applications as soon as possible as bookings can be closed any time. Once the application process is completed, the society will announce the ballot date. The successful applicants will then be able to submit the down payment and get allotment of their plots. Should you require more information about the booking procedure or assistance in your form submission, feel free to contact us via email at marketing@manahilestate.com.